ST. GEORGE — With sponsorship from PetSmart Charities and Best Friends Animal Society, P.A.W.S. 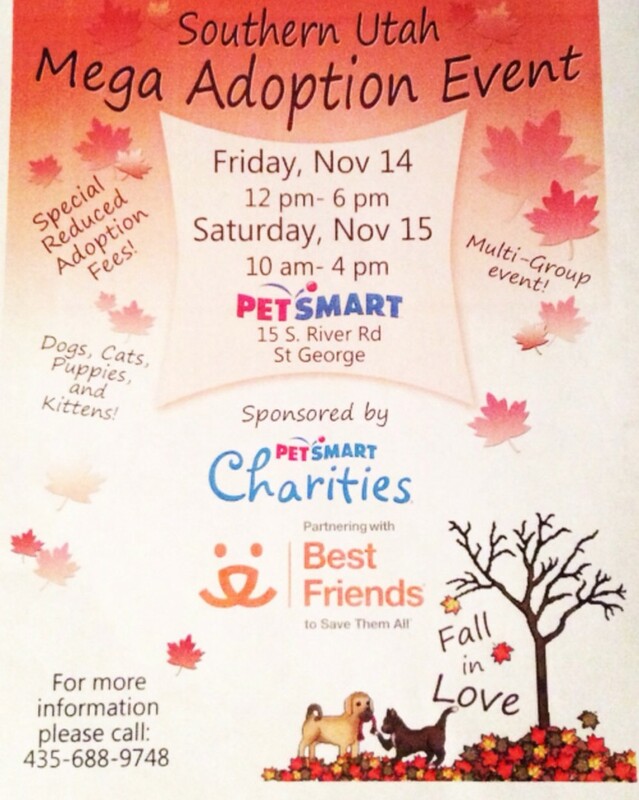 is spearheading the Southern Utah Mega Pet Adoption event Friday from noon to 6 p.m. and Saturday from 10 a.m to 4 p.m. at the PetSmart store in St. George, located at 15 S. River Road. City animal shelters from Hurricane,Washington City, St. George, Ivins and Mesquite, Nevada, will participate and bring adoptable dogs and cats. In addition to P.A.W.S., other participating nonprofit rescue groups will include H.A.R.T., Best Friends Animal Society, Because Animals Matter, We Care for Animals, and Second Chance Animal Rescue. P.A.W.S. will bring 50 dogs and 50 cats each day of the event, P.A.W.S. President Lynn Burger said. The goal this year is to have 50 adoptions each day, she said. “We’ve had over 100 adoptions in previous years and events, so we hope to get at least that much if not more this time,” Burger said. This is the first event P.A.W.S. has hosted in conjunction with PetSmart Charities, she said, but P.A.W.S. 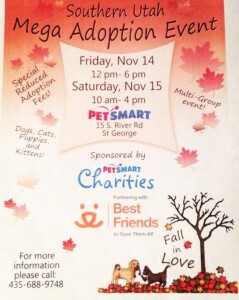 has partnered with Best Friends Animal Society on various adoption events for about 13 years. PetSmart Charities is a nonprofit animal welfare organization that saves the lives of homeless pets. Steve Pawloski, a Petsmart Charities spokesperson, said the organization is the largest in North America to support pet adoption. PetSmart Charities just supported its 6 millionth adoption since it began in 1994, Pawloski said. “It’s events like this one that make that mind-blowing number of adoptions possible,” he said. Patrick Boyle, a PetSmart store manager, said this year’s event will feature cheaper adoption fees, ranging from $35-$125 depending on the pet being adopted. At last year’s Super Adoption Event, the store’s front portion was filled completely with dogs, cats and rabbits, and this year should be no different, Boyle said. In addition to saving an animal through adoption, pet owners reap benefits, as well. Having a pet helps lower blood pressure, Burger said, and by adopting a dog, owners can keep physically active as they take it on walks. “This event is also a good chance for people to learn about the pet adoption process and to find a good, furry family member,” she said. Best Friends Animal Society will bring between six and eight dogs and 10 cats each day of the adoption event, Best Friend Animal Society Spokesperson Barbara Williamson said. Best Friends has worked with P.A.W.S. frequently on other adoption events, she said. In previous years, groups from northern Utah have come to Southern Utah to participate, but this year’s event is geared toward local animal rescue groups. All adoptable pets will be up-to-date on shots. For more information, call P.A.W.S. at 435-688-9748. When: Friday, Nov. 14, noon-6 p.m., and Saturday, Nov. 15, 10 a.m.-4 p.m. This is a. Great event, everyone should attend who can. And give these pets a. Chance… You will help in any ways you can this day… Maybe yo will fall in lve with one and give it a great home.. Please try and attend…. Again M AND M COOKIES, please edit before submitting your comment. Spell check is the greatest invention since sliced bread!! Totally unnecessary! I love proper everything,however M and M made her point well which was the important thing in this post. our current dog is a P.A.W.S. rescue and SHE is even greater than sliced bread! I just rescued a pure bred Doxie named Marine from the Washington City animal shelter, just a week ago today. Today he is getting his dental work done, or I would take him to the adoptathon to visit his former shelter mates. Not only is he greater than sliced bread……he is a better than some humans I know. I got mine! A senior male black Chi-Pom mix named Scamp! Such a cutie!